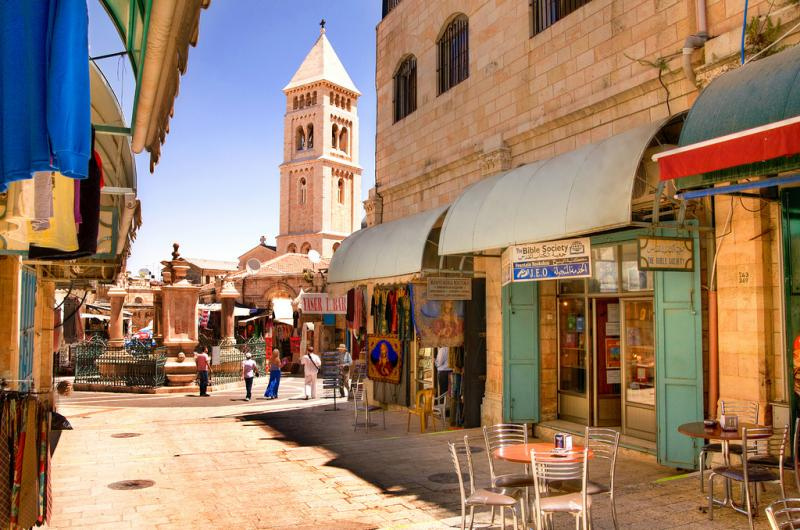 The Church of the Redeemer is the newest church in the Old City of Jerusalem, but its site has a history going back to Charlemagne, the first Holy Roman Emperor, in the 9th century. 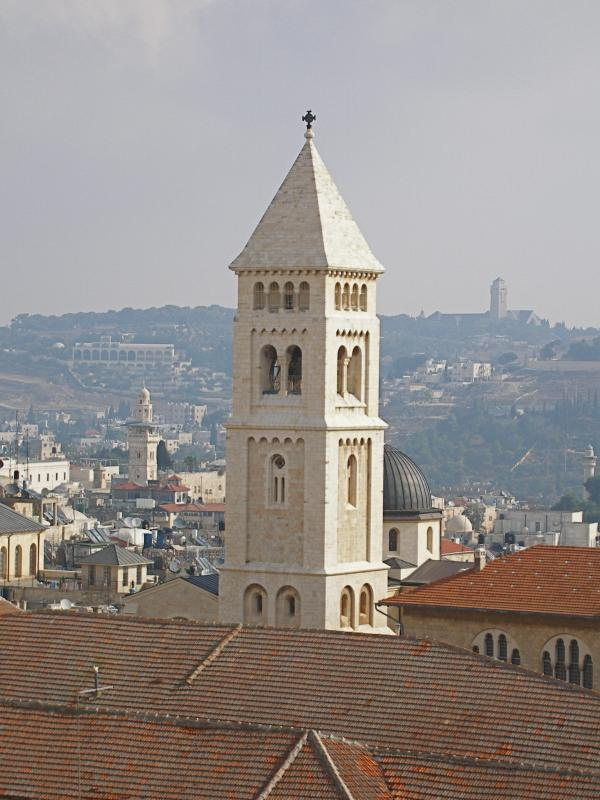 The plain-looking neo-Romanesque building — with a tall bell tower dominating the ancient Church of the Holy Sepulchre nearby — is the headquarters of the Lutheran Church in the Holy Land. It is the home to congregations that worship in Arabic, German, Danish and English. Underneath the church, an excavated area opened in 2012 allows visitors to see ancient remains from the pre-Christian era. The opening of the church in 1898 was a result of a 19th-century awakening of interest in the Holy Land among European Protestants. This had led Lutherans from Prussia and Anglicans from England to share a joint bishop of Jerusalem for 40 years. The Lutheran Church of the Redeemer stands on the north-east corner of a complex of streets called the Muristan (a name derived from the Persian word for hospital). It was built on the site of the medieval church of St Mary of the Latins, which had been in ruins for centuries. In Crusader times the Muristan was the bustling home of three churches with associated pilgrim hostels and a large hospital where the medieval Order of St John was established to care for the sick and wounded. Churchbuilding in the Muristan began after the Caliph of Bagdhad, Harun al-Rashid (of One Thousand and One Nights fame), gave the area to the emperor Charlemagne at the beginning of the 9th century. Only ruins remained when Crown Prince Friedrich Wilhelm of Prussia (later Kaiser Friedrich III) obtained possession of the eastern half of the Muristan in 1869 to build a church for the German-speaking population. During excavations for the foundations, an ancient wall was discovered and assumed — in error — to be the long-sought second wall of Jerusalem. 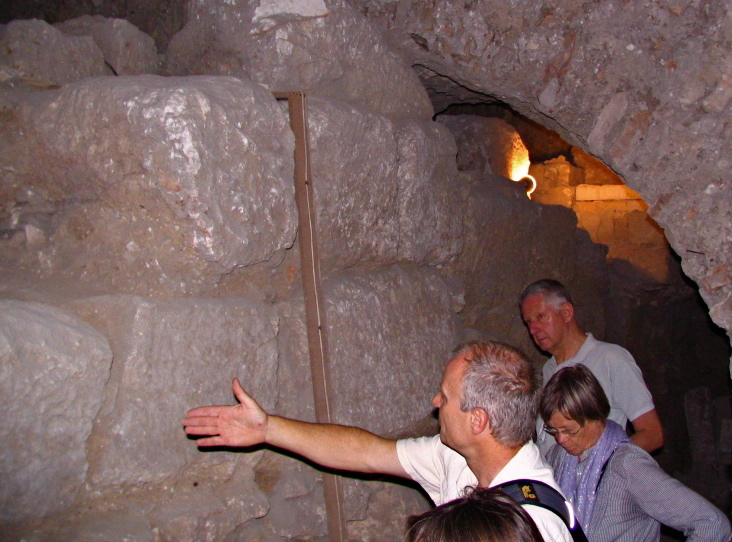 Because the location of the second wall was crucial to confirming that Calvary and the Tomb of Christ were outside the city at the time of the Crucifixion, the newly-discovered wall was regarded as a sort of relic that gave the new church a share in the status of the nearby Church of the Holy Sepulchre. This is why the church was named the Church of the Redeemer. Emperor Wilhelm II of Germany and his wife, Empress Augusta Victoria (daughter of Queen Victoria of England), attended the dedication in 1898, the emperor riding into the city on a white horse through a specially-made opening near the Jaffa Gate. On the same day, Wilhelm II took possession of a piece of land on Mount Zion to give to the German Catholics for a church. This is where the Church of the Dormition now stands. Inside the bell tower of the Church of the Redeemer, a circular staircase of 178 steps offers panoramic views of Jerusalem from 40 metres up. 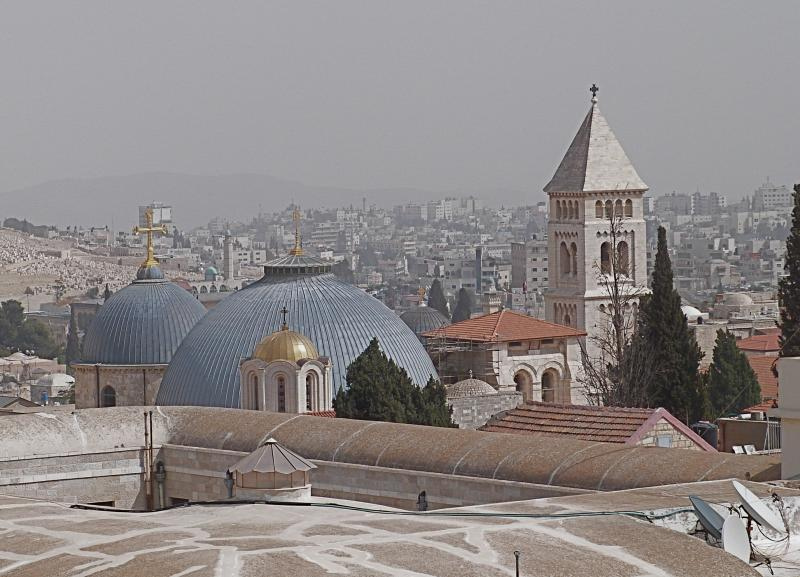 To the north is the Church of the Holy Sepulchre and other buildings of the Christian Quarter. To the east is the Dome of the Rock and, behind it on the horizon, the tall tower of another Lutheran landmark, the Church of the Ascension (also known as Augusta Victoria, after the empress). To the south, across the Muristan, is the Armenian Quarter and, on the horizon, the Church of the Dormition. 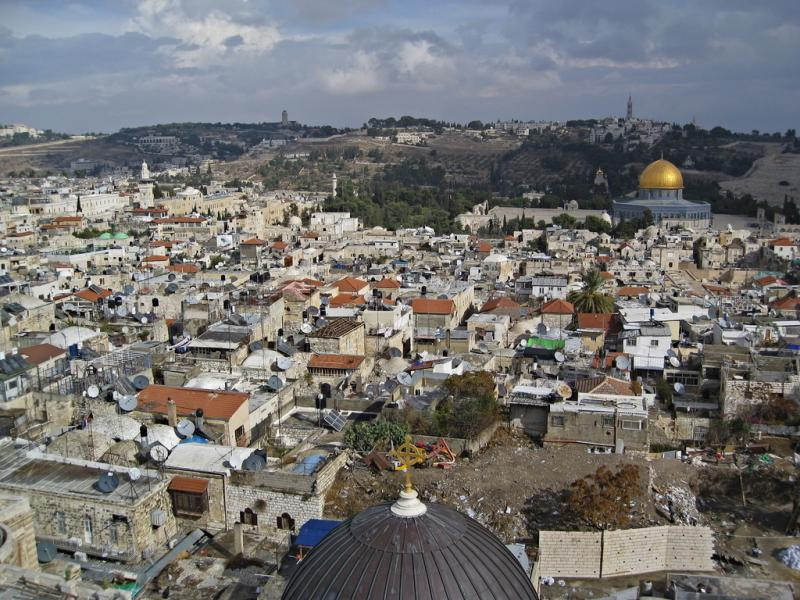 To the west, past the tall minaret of the Mosque of Omar, is the new city of Jerusalem. Though the walls of the church were originally richly decorated, renovations in 1970 left the interior bare, apart from abstract stained-glass windows and two images. In the apse above the altar is a mosaic medallion of the head of Christ the Redeemer. 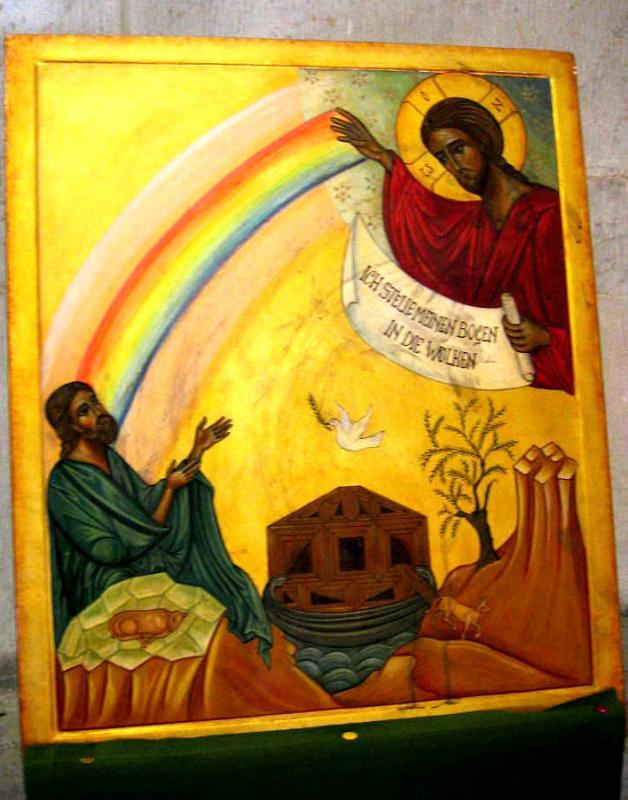 In the right apse is a brightly coloured icon in which God the Father (portrayed with the facial characteristics of Christ) sends a rainbow to Noah at the end of the flood. The German wording “Ich stele meinen Bogen in die Wolken” (I have set my bow in the clouds) is from Genesis 9:13. Beneath the church, archaeological excavations descending to a depth of 13 metres were opened to the public in 2012. These reveal ruins of the mosaic floor of the old St Mary of the Latins church (two metres below the present ground level) and the remains of a cobbled street. There is also evidence of a quarry that provided Herod the Great with stone blocks for his building projects and was later used for gardens around the time of Christ — findings that accord with Gospel accounts of the Crucifixion. Also revealed is part of the ancient wall that was wrongly thought to be the second wall of Jerusalem and is now believed to date from the late Roman period (2nd to 4th centuries after Christ). Beside the wall is a deep trench dug down to bedrock by archaeologists in the 1970s. The church complex includes an exhibition hall explaining its history and a two-storeyed medieval cloister, the best-preserved of its kind in Jerusalem. Adjacent to it is the vaulted Chapel of the Knights of St John. 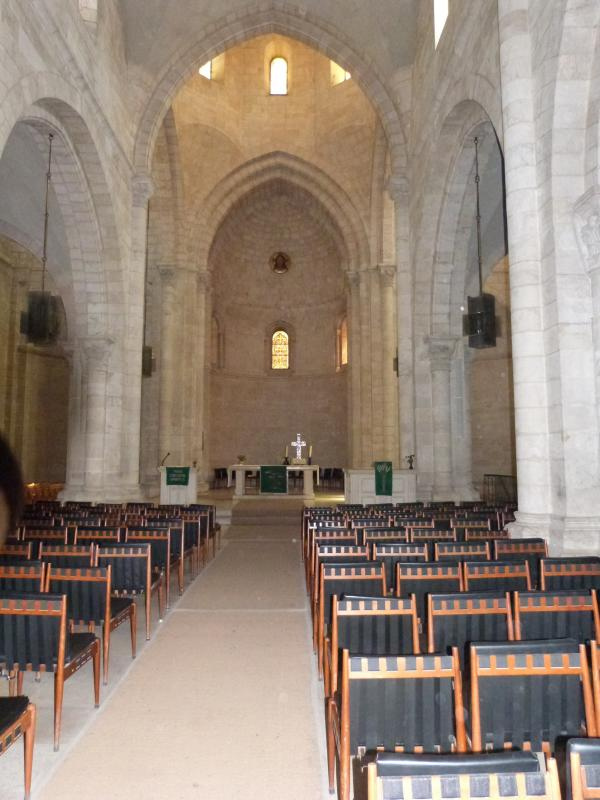 It is believed to be the original refectory, or dining hall, of the hospitaller knights. Open: Mon-Sat 9-12am, 1-5pm (closed Sunday). Museum: Mon-Sat 9-12am, 1-3.30pm.